Things are more than a little tense in Mexico right now, as false news stories urge Mexicans angry over a hike in gas prices to either loot stores or hide away in their homes. MEXICO CITY, Mexico — False reports on Twitter and Whatsapp have heightened a state of anxiety in Mexico over widespread protests against a rise in gas prices, prompting the country’s cyber police force to open an investigation into more than 1,500 social media accounts. “There is incitement that is being done deliberately to create panic,” Mexico City Mayor Miguel Ángel Mancera told Aristegui Noticias, a digital news site, on Thursday. During the interview, Mancera mentioned a viral Whatsapp voice note that cited several schools closed after rumors of a coup d’etat. (It is unclear if any schools actually closed due to the the reported rumor.) “We are on permanent alert,” he said. 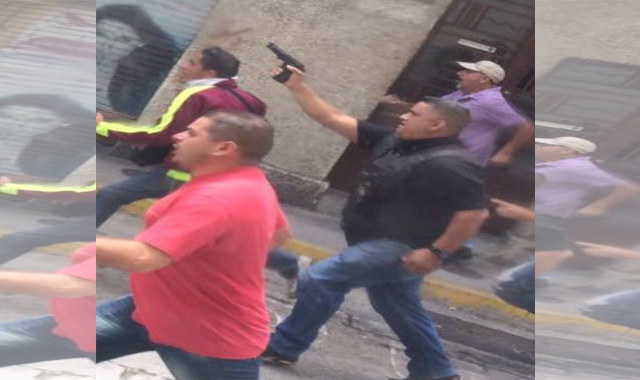 Ominous voice recordings by anonymous sources and photographs of gun-toting protesters — one of which was later discovered to have been taken in Venezuela last year — have been widely shared in recent days. In another viral photograph, men run down a street which on closer look, is adorned by store signs in Arabic. Twitter bots have been rallying people to participate in the looting of stores. 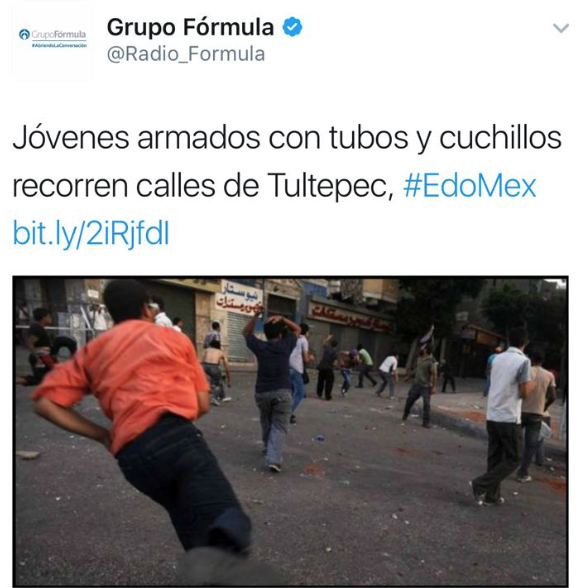 The viral spread of fake news reports, a global trend that became especially hard to control during the recent US presidential election, have propagated real mayhem in Mexico. One policeman was fatally run over on Wednesday while trying to stop a group of people looting a gas station. Acts of vandalism have spread to 14 states and more than 400 stores have been looted or shut down across the country, according to the National Association of Supermarkets and Department Stores. In one video, people are seen carrying large flat-screen TVs out of a chain department store in the State of Mexico. On Thursday, 987 people were arrested in connection to the protests, according to Animal Politico, a digital newspaper. The government palace in Monterrey, in northern Mexico, was defaced by a group of protesters; three people were injured. Violent demonstrations, store lootings, and protester-erected roadblocks have erupted across the country for the past six days after gas prices jumped 15%. Most goods in the country will become more expensive as a result, even as economic growth forecasts for the country have been slashed. Compounding fears of an economic meltdown in the country, the peso sank to a historic low after Ford announced it was scrapping plans to build a $1.6 billion plant in Mexico in response to pressure from President-elect Donald Trump. Last year, the peso became the second-worst performing currency in the world, losing more than 20% to the dollar, in part because of uncertainty relating to Trump’s impeding presidency. “I know there’s a lot of worry and anger over this situation,” President Enrique Peña Nieto said during a televised speech on Thursday night, speaking about the oil price hike. Not raising prices would have led to cuts in social programs, he added. “What would you have done?” he asked rhetorically. Fake news, meanwhile, continues to spread. Writer Erin Gallagher analyzed a group of users that had tweeted links to a story about a violent looting incident on Excelsior, a newspaper seen as friendly to the federal government. Gallagher discovered that at least 20 of them were bots created by an unidentified user. The tweets in question were sent from a group of accounts with similar username formats all during the same timeframe, she concluded. Amid the growing unease, people have started calling for restraint when it comes to sharing news. Jenaro Villamil, an investigative journalist, released a video urging people not to believe any unsourced information. Looking straight into the camera, Villamil called the recent events on social media a “dirty war” and asked Mexicans not to forward unverified reports to ensure that they do not become viral. Activist Antonio Franyuti published a series of GIFs via Twitter advising people not to share anything before finding at least two sources to corroborate news reports they come across and, if possible, talking to experts on the particular topics. The wave of fake news has already affected hundreds of small businesses in the country. A rumor circulated on Whatsapp earlier this week warning of a massive march down Francisco I. Madero, a pedestrian street in downtown Mexico City, prompting businesses to lower their shutters.